Late last week, Alaskan officials announced that they would be funding an exploration and surveying of Alaska's largest volcanoes, which they say could provide enough energy to power thousands of households. In an era of soaring energy costs, wind and solar are often thought of alternatives. Geothermal, especially volcanic geothermal, is a more surprising source to many. However, volcanoes and hot springs are estimated to be able to provide at least 25 percent of Alaska's energy needs, according to experts. The government is pushing utilities to lease land on Mount Spurr. The mountain is an 11,070-foot active volcano and erupted as recently as 1992. The government says power companies can tap into the vast heat teeming beneath the volcano's surface to generate power. A lease sale will be held in August to these ends. The government is planning many similar sales. 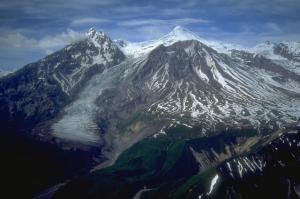 The government is also targeting 4,134-foot Augustine Volcano, also near Anchorage, for prospecting. Alaska is not alone, either. Dozens of states have geothermal resources. Experts estimate that if fully exploited, these resources could provide 25 percent of the entire nation's power needs. Karl Gawell, executive director of the Geothermal Energy Association (GEA) states, "High prices and climate change are definitely creating a renaissance in geothermal interest, particularly on a state and local level." Currently tax-subsidy eligible projects are underway in Texas, Florida, and most of the western states. These projects are just the "tip of the iceberg" according to Mr. Gawell. He states, "If we really want to go all out for it, we could easily achieve a substantial amount, 20, 25 per cent of US energy needs within a few decades. We're limited more by public policy than the resource - the resource is enormous." According to the Bureau of Land Management, 12 states -- including Alaska -- have high potential geothermal lands. The most recent survey showed 200 million acres of public land with geothermal potential. However, Mr. Gawell says that these tracts, while impress are only part of the nation's hidden geothermal resources. He says many geothermal plots likely exist without outward features like hot springs. By his estimates 80 percent of the geothermal land in the U.S. remains undiscovered. In Alaska, home to many easy to see geothermal power sources, geothermal seems like common sense. However, since the 1970s development has been put on hold thanks to Alaska's abundant oil resources. Now with oil price at record highs, Alaska is reconsidering geothermal. The greatest challenge remains in coming up with innovative designs to tap the massive heat wells. Some are rising to the challenge; among them is a resort at Chena Hot Springs which is entirely powered by hot springs. It features hot springs driven interior heating and cooling, power, refrigeration (for its ice museum), and heating for a greenhouse. The resort near Fairbanks is gaining much attention for its innovations. Presidential candidate Senator Barack Obama mentioned the potential for geothermal power in a recent speech. However, Mr. Gawell argues the issue is still not receiving the level of attention it deserves. He says, "The problem is it's only being produced in a handful of states. It's well known in those states but it's unknown in others." Outside the U.S., Europe is also experiencing strong interest in geothermal power. Europe is the birthplace of the power technology, with the first plant built in Larderello, Italy in 1904. The GEA is predicting that the number of countries worldwide using geothermal will more than double to 46 by 2010. While exploiting geothermal resources at volatile sites like volcanoes sounds dangerous, there is tremendous profit to be had with the risk. With proper monitoring, these sites could be safely operated to produce immense amounts of electrical power. It appears that Alaska may be on the leading edge of a new alternative energy revolution that's right under our feet.